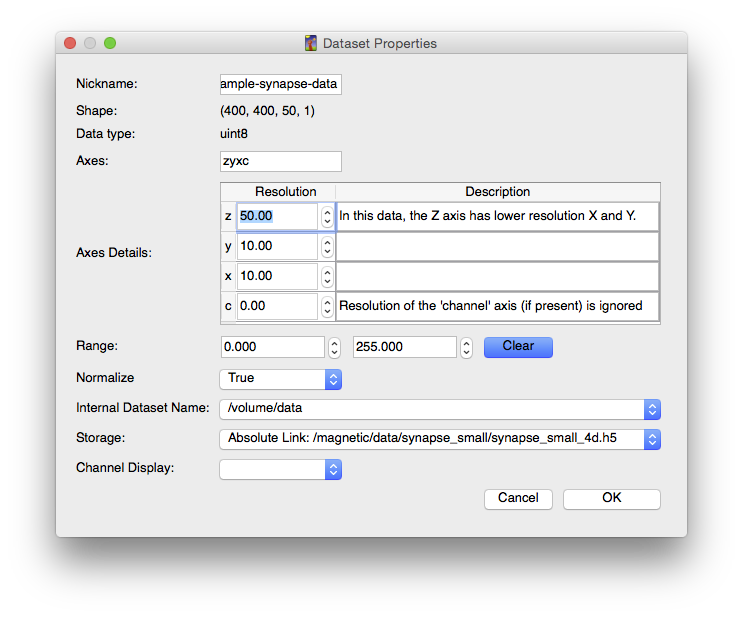 The IIBoost Synapse Detection workflow is a specialized variant of the generic Pixel Classification Workflow aimed at detecting synapses in EM data from mammalian neuropil. Instead of using a random forest classifier with arbitrary label classes, it uses the IIBoost classifier for identifying mammalian synapses in EM data. The classification technique is described in Learning Context Cues for Synapse Segmentation. On the Feature Selection page, the set of recommendend features is already selected for you. You can change them if you wish. On the Synapse Detection (a.k.a. Training) page, you cannot customize the label classes. They are hard-coded as Synapse and Non-synapse. 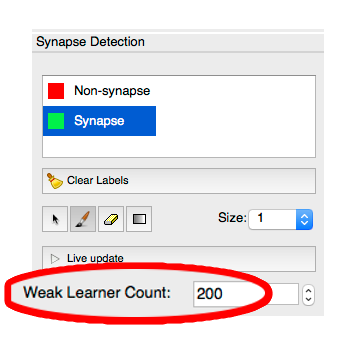 You may adjust the accuracy (and speed) of the classifier by changing the Weak Learner Count as shown below. : C. J. Becker, K. Ali, G. Knott and P. Fua. Learning Context Cues for Synapse Segmentation, in IEEE Transactions on Medical Imaging, vol. 32, num. 10, p. 1864–1877, 2013.